Damn you, oxymorons that make sense! 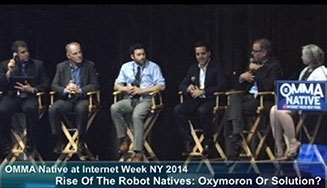 Shapiro was speaking on the “Rise Of The Robot Natives: Oxymoron Or Solution?” panel to close out OMMA Native at Internet Week New York on Monday. The panel’s moderator, Steve Carbone, managing director of digital and analytics at Mediacom, pointed out the apparent backwardness of “programmatic native” and asked the panelists if automating the entire process of delivering a native ad goes against what "native" really means at its core. Ben Lampert, associate director of Audience on Demand at VivaKi, doesn’t think so. “No” Lampert said, before explaining how customization can come from analytics. He argued that automation -- including analyzing data -- and customization go hand-in-hand. 2 comments about "Intrusive Intimacy". Mike Einstein from the Brothers Einstein, May 20, 2014 at 10:26 a.m.
"That isn't how it works! That isn't how any of this works!" Mike Marn from SIU, May 29, 2014 at 9:56 a.m.